Rocking Chair it’s called, sounds like a place grandma might sit and knit. But Rocking Chair has actually been the sight of everything from pond skimming to Seth Wescott’s World Cup Boardercross run, to the Simon Dumont Cup – where young skiers perform their latest greatest tricks in front of TV crews and crowds. But this snow covered section of trail at Sunday River had far more humble beginnings. Fifty years ago, it hosted the very first skiers at Sunday River Skiway. A T-bar deposited those inaugural skiers up 1,000-feet on Barker Mountain, most wearing wooden skis made in nearby Paris . The original Rocking Chair and neighboring Cascade trail, covered with a thin layer of natural snow on Dec. 19, 1959, were the start of what has become the second largest ski resort in New England. Flash forward fifty years, Sunday River is home to 132 trails on eight peaks served by 16 lifts, and one of the most sophisticated snowmaking systems on the planet powering 1,900 guns. Now my history with Sunday River is not as long and legendary as Dave Irons who skied Sunday River on that at first day 50 years ago. Dave went on to ski patrol at Sunday River from 1968 to 1988, serving as Ski Patrol Director from 1971-82. My first trip to Sunday River was in 1989; my brand new husband and I were visiting from Smugglers Notch, Vermont – our home ski resort at the time. It was March and the moguls were humongous on the hot new trail, White Heat – dubbed the longest steepest widest trail in the East. I was flabbergasted by the plethora of lifts – quads and triples no less. 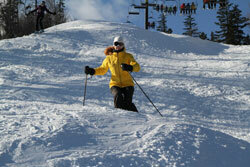 Coming from Smugglers, I was accustomed to aging doubles, so to me Sunday River was a mountain on the move. 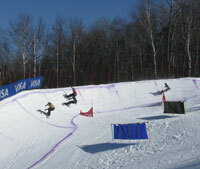 It was the 2nd annual Bust n Burn featuring the Legends of Freestyle Skiing. Stretch pant wearing superstars Wayne Wong and Scotty Brooksbank bashed the steep slushy bumps of White Heat under the warm sun, popping backscratchers and spread eagles, dueling head to head with daring locals. Life was good at the River. Les Otten was in charge and charging forward with snowmaking, new lifts and new mountains. Aurora and Jordan Bowl were still mere plans on his office wall. Little did I know then that I would end up living in Maine, frequently skiing the superb snow made at this Maine resort which would expand to 671 acres, and writing this weekly ski column. 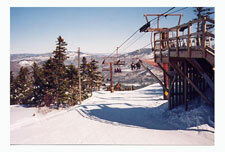 What I did know – Sunday Punch was, and probably still is, my favorite trail at Sunday River. Perhaps that is because my grandfather told me it was his favorite, he remembered skiing Sunday Punch when it was added in 1961 along with Sunday River’s 2nd T-Bar. 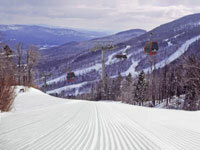 From Sunday River Skiway to The Otten Empire, SKI and ASC – American Skiing Company, to present day Boyne, Sunday River is one of the Best New England Ski Resorts.